I didn’t get a chance to read this book until this morning and then, I did not read the whole thing. It’s almost 500 pages long. However, just skipping through the chapters I could tell it is an exceedingly comprehensive book on publishing. I wish I’d read it twenty years ago because as they say in Chapter 2, A World Wide Wonderland, “. . .these days it’s imperative to start assembling an audience long before you’ve written a word.” To someone who’s been writing as long as she can remember that’s like saying “assemble an audience before you’re born.” Sheesh. 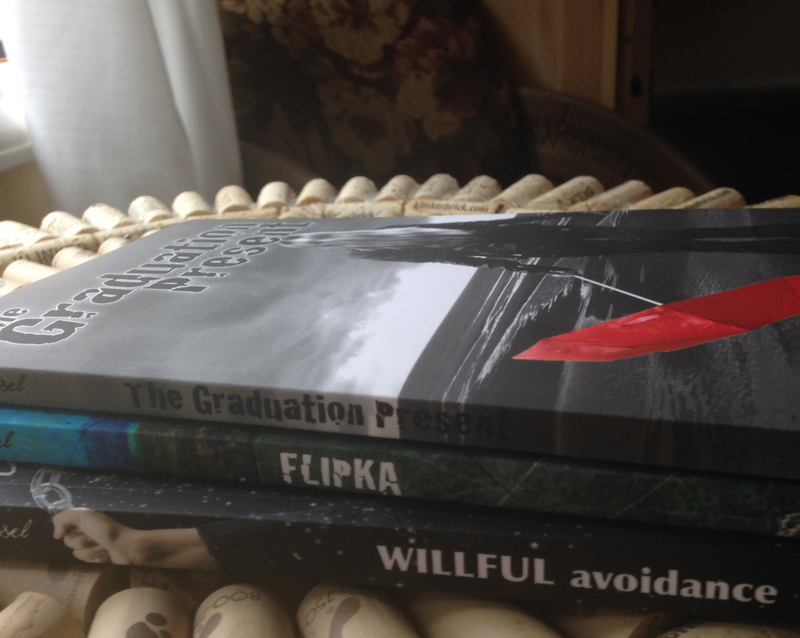 My first book Flipka was in final edits before I even knew about twitter accounts. Too late chicka. No audience, no book deal. Mom and Dad don’t count. The chapter on blogging contains some interesting factoids I did not know, for example, you’re supposed to post pictures of yourself at various stages of life. Readers love family pictures. Really, what do you think? I was always a little odd. If you’re going the traditional route, there’s gobs of information on dealing with agents, how to get a larger advance from a publisher, and how to conduct yourself on television interviews. Ah, not my big worry right now. Ah, Miss Twissel, did you get the memo about being youthful, attractive and scintillating for your TV debut? You look a bit like Methuselah. Upgrade to off-white paper instead of white. It looks more professional and is easier on the eyes. Regarding item 1, writer’s services include editing, proofing, layout, cover design formatting, ISBNs, website design, bio help (professionally done head shots), marketing, distribution, etc., etc. The book contains many stories of writers who’ve gone the whole hog versus those who’ve flown by the seat of their pants. In the end success generally came down to perseverance on the part of the author, no matter how much money was spent. Regarding item 3, to list yourself as a publisher all you need to do (in the US) is register your name as a business with the county clerk. For about $50 JT Twissel became a business with me, Jan, as the President. Now if I could only afford an admin. I want to thank Krista over at Krista at the Heart of It All, for the recommendation of Silverwood Books. I did check them out (even saw your book listed!) and they seem exceedingly professional. Their packages seem competitively priced and a good deal but I’ve already gotten fairly far along in the process thanks to my previous publisher. I will probably go with CreateSpace. Now thanks to Cinda I have a good idea what to look out for and which services to spurge on. Maybe I’ll actually get started tomorrow. Ya think? This entry was posted in Posts, Writing and tagged family pictures, self-publishing, writing. Bookmark the permalink. Thanks, Jan. Reviews of The Essential Guide … are enthusiastic. Let’s see what happens. I know – just do it! Really interesting Jan. I use Feed-a-read for my POD, though I also set up with Createspace to see which looks best for each book. They are easy to sue and give better royalties than Createspace but probably have other downsides. They even have real people check your formatting. Apart from an editor to check for typos etc and a cover designer I do it myself (maybe it shows). I agree – the essentials are a good editor and cover design. That’s where I put my money. I’ll check them out – thanks Geoff. It’s seems like there’s no publisher without some problems. I guess you have to decide what you’re willing to live with. I hope WA doesn’t bring up too many bad memories and thanks for reading! Nope, I’m sure it won’t it is such a compelling read. That sounds like a book I might have benefitted from at least ten years ago as well. Go Jan Go! I never dreamed of spending $50,000 – or even 5 figures. But I probably should have invested in marketing – I did it mostly myself, slowly and insufficiently! You did a lot better than me! Oh, it’s like a minefield out there, Jan, but thanks for looking into this and giving us your tips. I’ve still a lot of work to do, but I’m still feeling the excitement of publishing that first book. I’ve very excited for you as well! Today the weather was good and the air breathable so I took a break and enjoyed nature. That sounds just the ticket. We all need a break from time to time. Looking forward to continuing the journey with you. Probably the last thing you need right now is another book recommendation…but “Making a Literary Life” by Carolyn See is highly motivating and gives some clever ideas on how to become known. She attended our Mendocino Coast Writers Conference about 10 years ago and was a delightful teacher and human being. I definitely need clever ideas! Thank you Kate! I’ll check her out. Proud to know you President Jan.